Mumbai : Pune adventurist Shital Rane-Mahajan set a new record by becoming the first Indian to skydive sporting a colourful "Nav-wari sari" in Thailand on Monday. 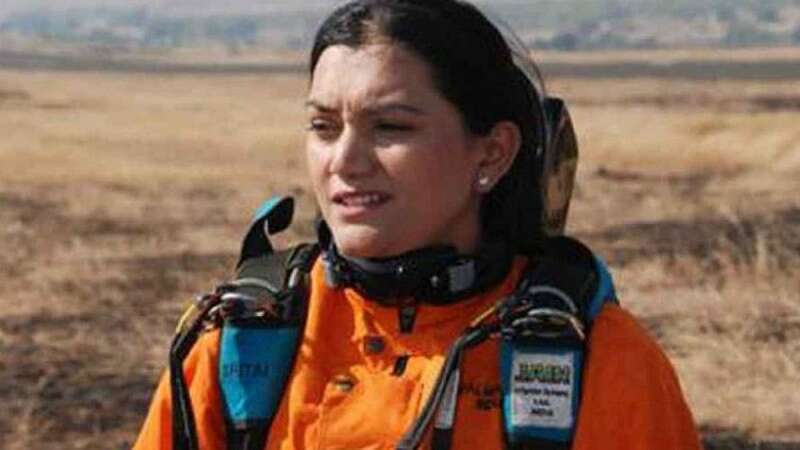 "I wanted to do something different with International Women's Day coming up next month, so I decided on wearing the Maharashtrian 'Nav-wari sari' for my skydives," Rane-Mahajan told IANS on phone from Thai Skydiving Centre. Recounting her experiences, she said that wearing the "Nav-wari sari" itself is a challenge since the attire is nine-yards (8.25 metres) long -- compared to six yards of the regular Indian sari. "First, to drape the 'Nav-wari sari' properly, plus to wear the parachutes on it, the safety gear and communication equipments, helmet, goggles, shoes, etc, add on to and make it all quite a challenge," Rane-Mahajan explained, as she seemed to stumble in her first landing but escaped unhurt. She grinned and admitted she had to make a lot of "extra preparations and precautions" for draping the "Nav-wari sari", including pinning it up tightly and taping it in many places to ensure it did not come off her body from the staggering height as she soared down, with strong winds from the Gulf of Thailand lashing all through her descent. Rane-Mahajan said that the country's signature women's wear sari is draped in different styles all over India, but the Maharashtrian style of "Nav-wari sari" is probably the most difficult and toughest to manage for women. "I wanted to prove that Indian women can not only carry the sari graciously in their routine lives, but can also use it for high adventure like skydiving," smiled the 35-year old extreme sportswoman. The jump was originally scheduled on Sunday (February 11), but had to be postponed due to sudden heavy rains and stormy weather in Pattaya, though she managed a jump from 9,000 feet height. With this, the Padma Shri laureate and mother of two sons (nine-year old twins) has set around 18 national skydiving records, plus six international records and completed 704 jumps around the world, bagging several national and international honours. She shot to global fame on April 18, 2004, when she made her maiden jump -- without practice dives -- on the North Pole from a Russian MI-8 helicopter hovering at a height of 2,400 feet in minus 37 degree temperatures, making her the first woman in the world to accomplish the feat. Two years later, on December 15, 2006, Rane-Mahajan made the world's First Accelerated Free Fall Parachute Jump on South Pole in Antarctica, from a Twin Otter aircraft, coming down from a height of 11,600 feet. On April 19, 2008, Rane-Mahajan tied the knot with a Finland-based engineer, Vaibhav Rane, and also created another national record. The couple got married in a hot-air balloon, complete with a priest performing the ceremonies and parents in tow, around 750 feet up in the air above the Pune city skyline. Incidentally, Vaibhav is also an avid skydiver with 57 jumps to his credit. They became the first Indian civilian couple to skydive together in November 2011. However, she still is keen on pursuing her dream of skydiving over Mt. Everest, with two unsuccessful attempts made in 2010. At present, Rane-Mahajan is on a real high -- with dives on all seven continents -- in around 10 years, on Antartica, Australia, Asia, Africa, Europe, North America and South America. Last year, she became the first Indian woman to be nominated by Aero Club of India for the prestigious FAI Sabiha Gokcen Medal for completion of skydiving on all seven continents.